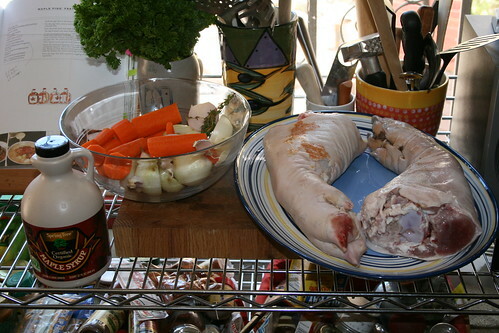 So... once again, back is the incredible, edible pig's foot. Now with more... maple? 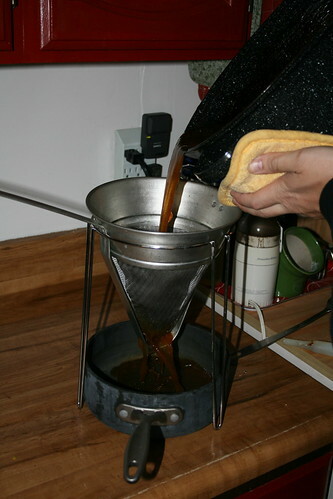 But... it also prominently featured Maple Syrup. And despite our stunningly great experience with the pouding, Jacob was skittish about this. He's always been suspect of maple - and syrups in general - associating them with the two breakfast foods he least likes: pancakes and french toast. On too many Sundays mornings in his childhood, he would fruitlessly try to increase his enjoyment of those dishes by adding whatever syrup was available and ending up with a mushy, oversweet mess on his plate; and invariably he would end up going hungry after refusing to eat his creation. So there was trepidation. For a moment - but then, it evaporated as he thought to himself: "Surely, Mrs. Butterworth has nothing on authentic Canadian Maple Syrup! I must Trust in Chef Picard! I must have faith! I must move forward! I must let go of my fear!" 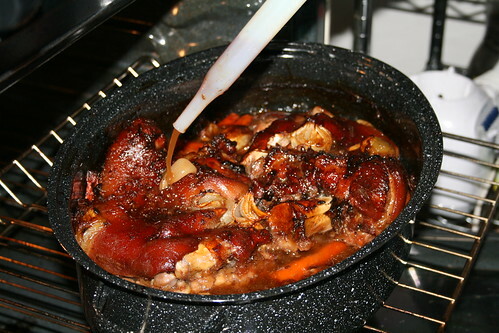 And so it was that he chose PDC Maple Pig's Feet for this week. Oh my. 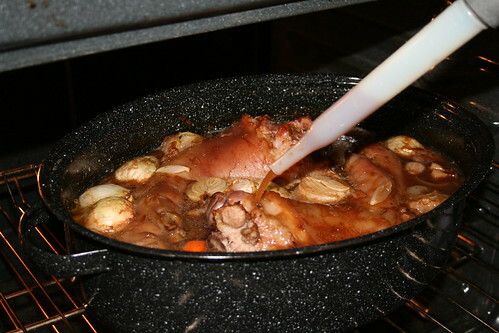 The skin was delicious and sweet and crunchy (even though had been braised mercilessly). The sauce was salty-sweet, in good proportion. But the sweetness was not overtly maple. M said that she would have been hard pressed to identify it as maple, had she not known it to be so. Jacob thought very much the same thing. Regardless, this was delicious, more than delicious - super muy licious. 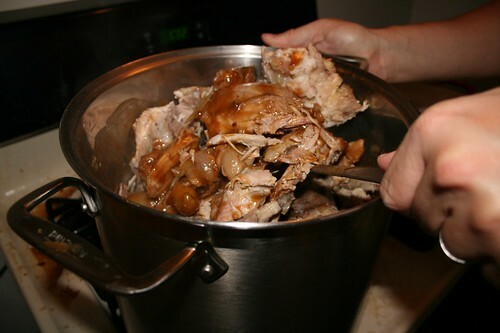 We have gone from being braising believers to being braising zealots. 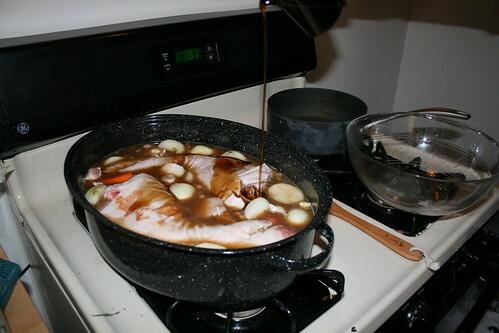 And we are considering what to braise in pork stock - or onion soup base - and maple syrup next. Cornish game hens? Salmon? Lamb? This will be revisited in an OOS, we are sure. 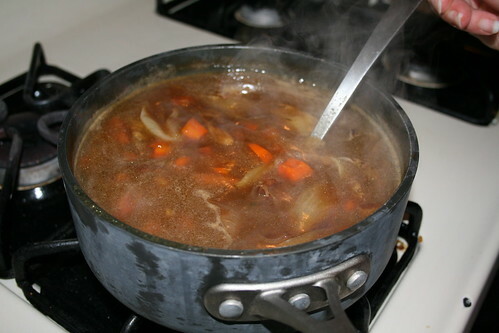 Note to selves: Just because it's labelled "pork stock" in the freezer, that doesn't mean that it's pork stock. 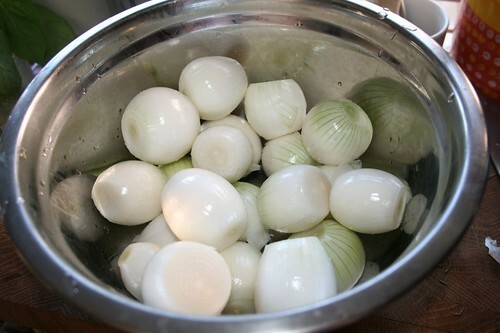 Could be onion soup base, after all. 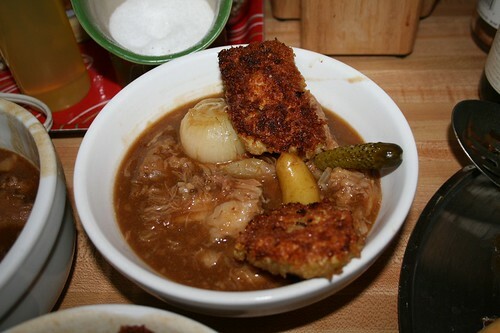 Note to selves, 2.0: Onion soup base makes a good substitute for pork stock! 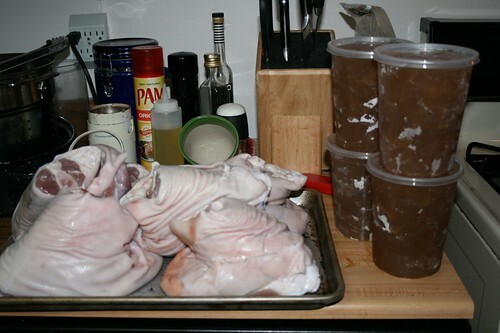 Time, mis to eat: About 5 hours, not including brining (+24 hours). Blast From the Past: Let's talk about stock, baby. So here we are, back again... and yet it feels like the first time we've ever been around. We're going for the gold in the next two entries, presenting to you two recipes so unimaginably amazing that we're still not sure that we were actually able to pull either one of them off. One involved quite a bit of labor, planning, effort, and company - and the other was almost shockingly easy to construct and went down so well with a glass of champagne that we were nearly embarrassed to be eating it just ourselves. 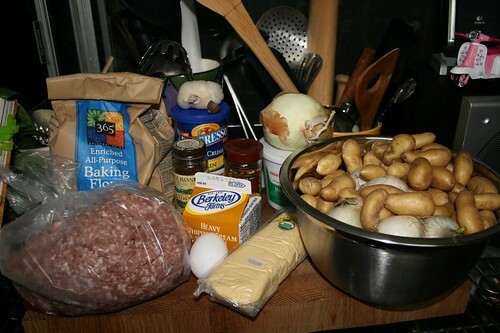 In this entry, we present our attempt at Pig's Feet Meatball Ragout... a stunning dish, just the thing for a cold summer night in San Francisco. 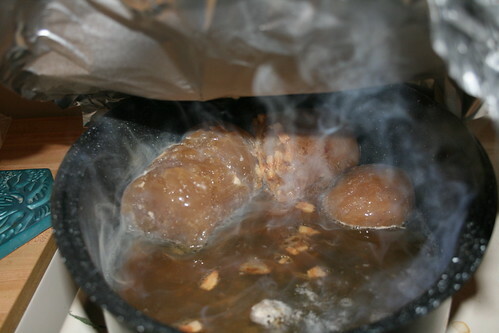 In the next entry, we will present Maple Pig's Feet... a wholly different thing altogether, an almost mysterious set of tastes from a simple set of ingredients. We've kept you waiting long enough. It's time dive in. It's time to see if we can find, for just a moment, what it is about pied de cochon inspired Chef Picard so much. Let's mis en place, shall we? And served it to ourselves and two of our test subjects friends. Hélène is quite right to love this. We loved this. Our guests loved this. Our dog would have loved to love this, but she didn't get any. 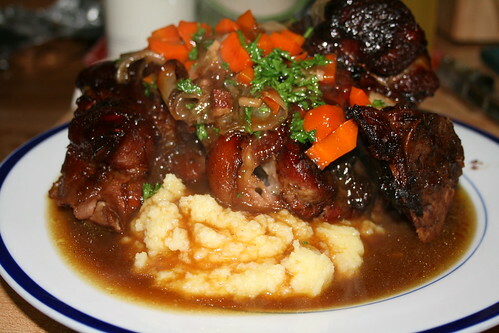 As you may imagine, this dish was almost overwhelmingly porky. 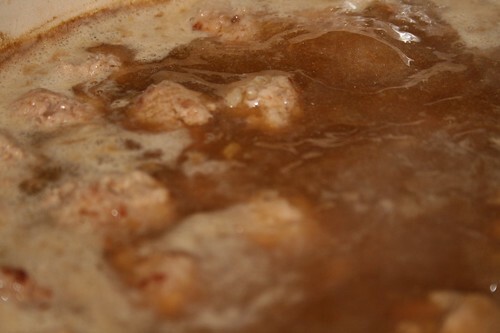 (Braising everything in pork stock will do that.) It really was just right up on the edge, but still on the good side; according to us and to our guests. The little cornichon was actually a perfect touch, it cut through the dish wonderfully, and we all ended up having several of them with each bowl. Note to selves: Do NOT attempt to reheat this on the stove. Jacob, wanting more the next day, stuck the whole pot on the stove to warm it up... forgetting a fundamental of cooking: do not put heat on a roux and walk away. 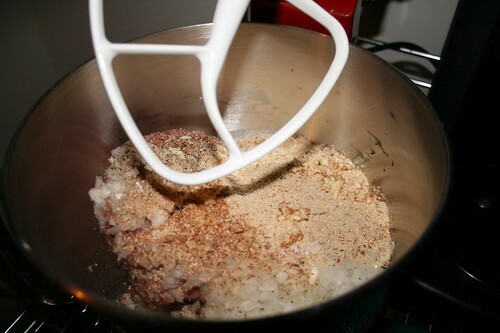 The entire leftover was ruined (more than half the dish) because the flour, which we had taken such care to roast carefully the day before, burned; producing an intensely smoky and unpleasant flavor that permeated the entire dish. Time, mis to eat: A long, long time... more specifically, about four hours. Browning the flour took a surprisingly long time, but once it started to brown over it moved quickly... do pay close attention to this part. 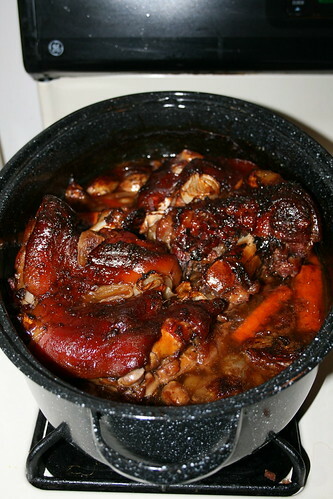 Next up: Footy fun continues with PDC Maple Pig's Feet. 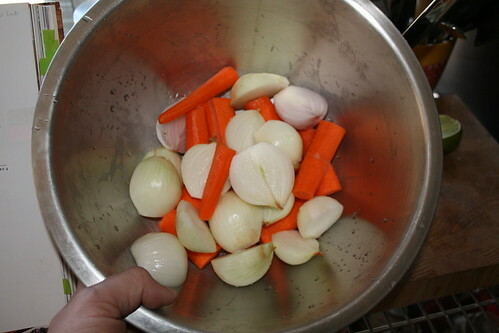 Blast From the Past: In what could possibly be foreshadowing: Onion Soup. So... we're back. There's been company, there's been madness, there's been mess... but that's all over, and we're back in the kitchen. Cooking it up. 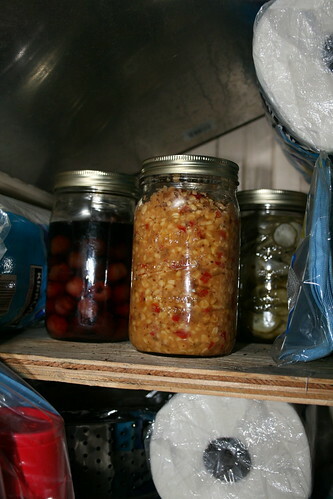 Canning it down. Doing it for YOU. 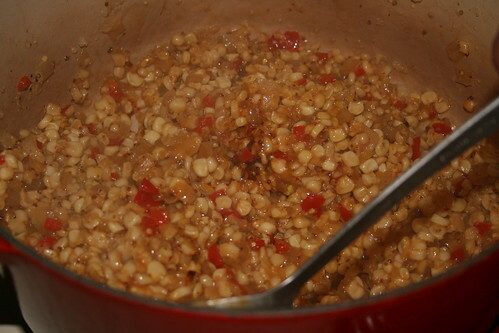 First up... some corn relish. No mis en place for this one - we were multitasking - but so you know, this dish involved corn, some delicious red bell peppers, vinegar, and some other stuff. The first thing we needed to do was get the corn off the cob. 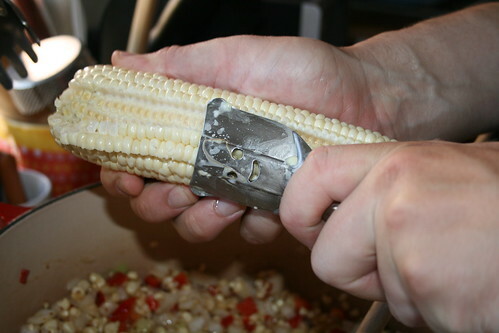 And what better tool for that than... the CORN ZIPPER? We'll taste it in about a month or so. For this recipe we leaned heavily on M's early 70's era Better Homes and Gardens cookbook, which has a substantial and detailed canning section. 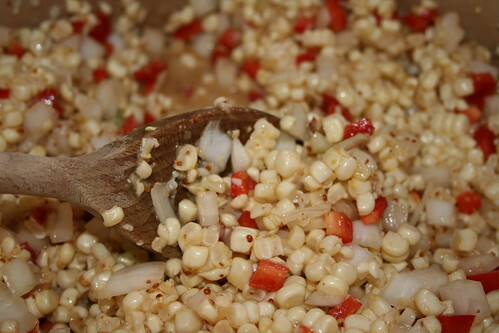 It also had a recipe for corn relish that was much like the one we made here! But we're sure that it is not nearly as good as this will be. 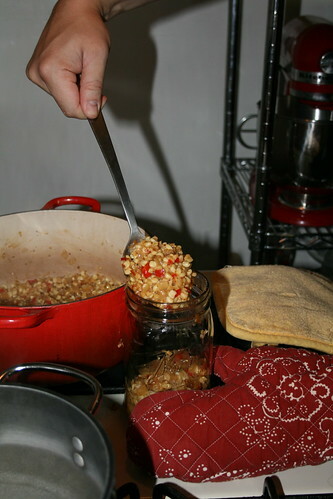 Note to selves: We used about six ears of corn for this and got one mason jar out of it and maybe a forkful (each) to try. Next time we'll use more corn get more fresh to eat, because this was goooood. 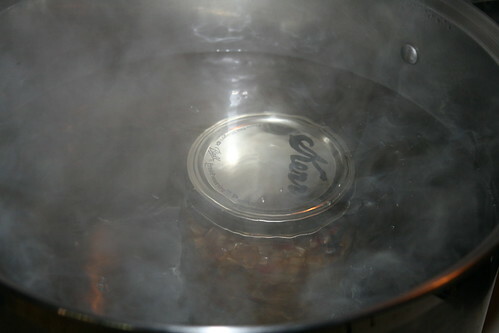 Time, mis to eat: About two hours - most of which was either simmering the relish or boiling the can. 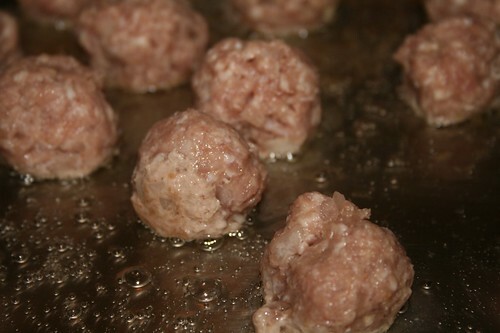 Next Up: Pig Feet Meatball Ragout. Really! 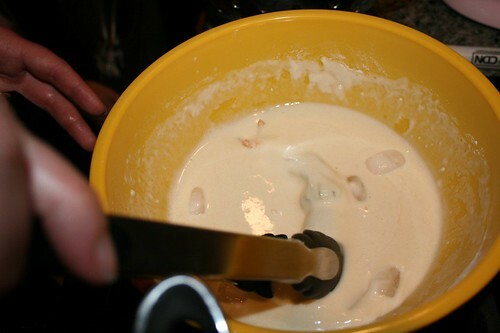 We have house guests at the moment, so blogging time is a bit limited, but here's a preview of this week's entry! 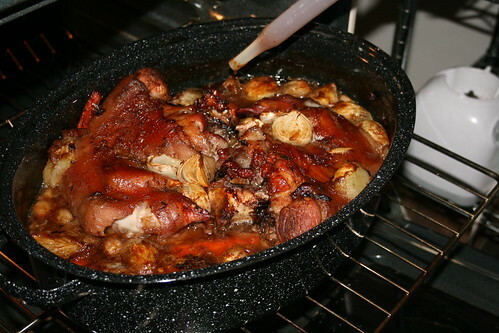 It involved all sorts of porky goodness, front pig's feet, back pig's feet, pig neck, shanks, ground pork meatballs and fried pork on top. 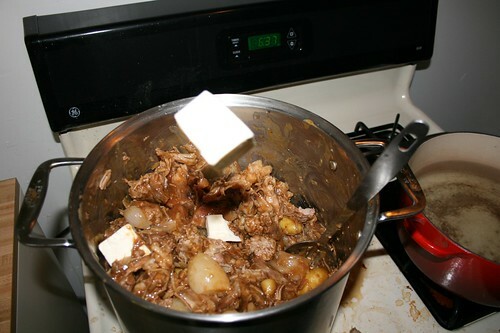 (Oh, and some potatoes and onions. 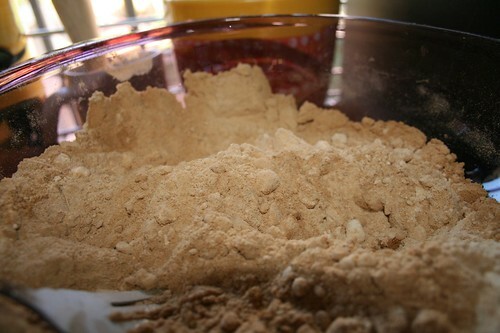 To make it healthy.) Porktastic! 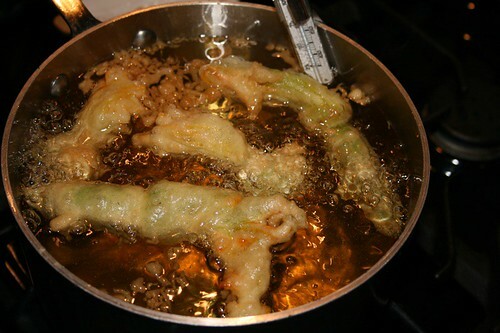 So finally, after a false start a couple of weeks ago, we were able to find some nice, fresh zucchini blossoms. 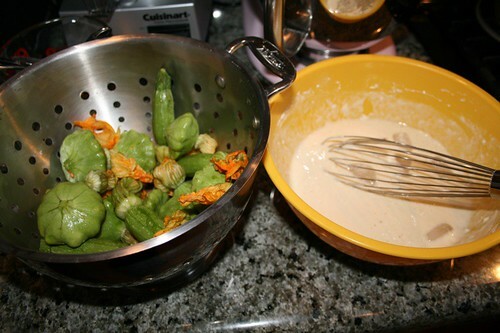 And while we were at it, we got some squash blossoms as well. And with these wonderfully fresh items - procured from our new favorite farmers market - we went to our friends' house and went... to... town. And then we fished them out. And ate them. 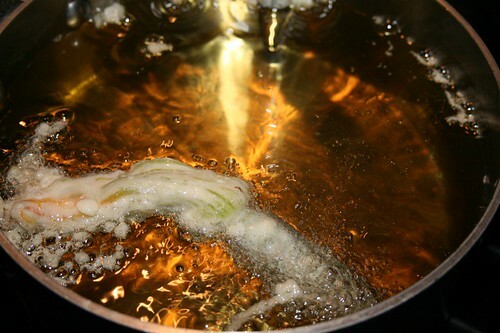 Notes to selves: Things directly removed from hot oil are... hot. And they rock. 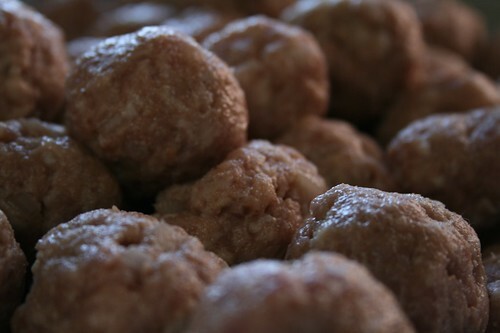 And are really good and light and wonderful. 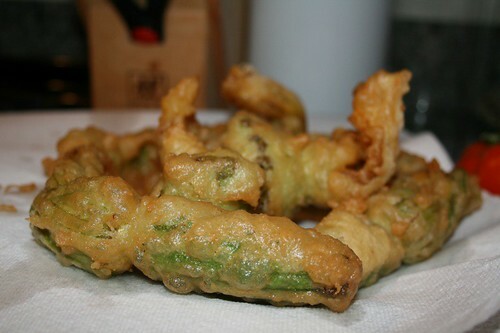 And the tempura onion rings we made with the remainder of the batter were freakin' awesome, as well. Time, mis to eat: 45 minutes. 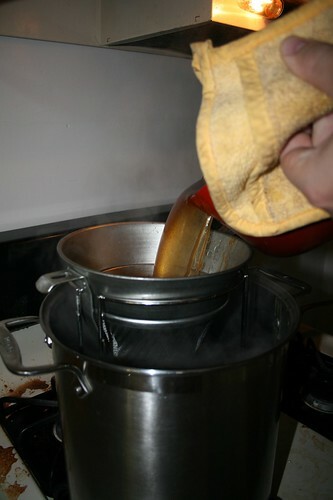 30 of which were heating the oil. Or maybe not that long. There were some margaritas involved, and maybe a manhattan or two as well. 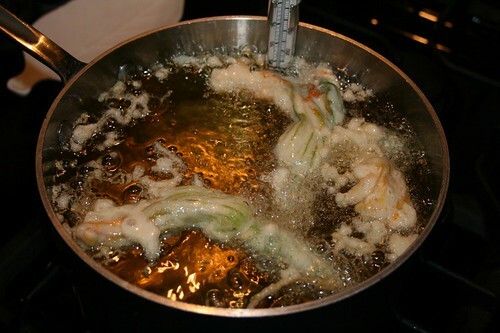 Typical deep frying time, let's say. Next Up: Honestly? Unclear. Depends on what we find at the farmer's market and how many dishes we feel like washing. TBD. But it will be good! Oh, it will be good! Blast from the past: We were to understand there'd be punch and pie.